Pug Characteristics: The faithful and sweet-tempered Pug is a breed of small dog classified as a member of the Toy Dog Group (AKC:1885). The Pug, is characterized by its short, sturdy, dignified appearance with a distinctive large, round, wrinkly head and an alert, lively expression. Other characteristics include dark, lustrous, large, round eyes; small, velvety ears; a high-set, curled tail and a steady, purposeful gait. The temperament of the Pug can be described as Affectionate, Courageous, Loyal. The coat type of the Pug is described as short, fine, soft, smooth coat in black, fawn colors. Due to its characteristics and qualities, the Pug demonstrated the desired traits of a Companion and Lapdog and is known by its nick name the "Monk's Dog". The origin of the Pug dog breed was in China where it was developed in the Ancient Times. Pug Breed Group and Dog Type - Toy Dog Group (AKC:1885): The Pug is one of the many breeds of dogs that belong to the Toy Dog Group (AKC:1885). Other names for the Pug: The Pug is known by the nickname of the "Monk's Dog". Other names for this breed of dog include the Chinese Pug Dog and and Mops. The Spanish refer to the Pug as a 'Dogullo' and in Italy a Pug is called a Caganlino. The nickname 'Mops' derives from the Dutch name for the Pug, shortened from the name 'Mopshond' meaning "to grumble", the Dutch also called the Pug the 'Dutch Bulldog'. Origin of the name Pug: The name "Pug" is derived from the Latin word 'pugnacitas' meaning a "fondness for fighting" or "combative" as in pugnacious. In the 1700's the name "Pug" came to mean "a dwarf breed of dog resembling a Bulldog in miniature". Pug History and Origin: The country of origin of the Pug breed was in China during the Ancient Times. The Pug is believed to have descended from the ancient, now extinct, Chinese Happa Dog and the Pug therefore has a shared ancestry with both the Pekingese and the Shih Tzu dog breeds. The Happa dog had a wide stance in the front legs but were narrower in the rear legs and dates back to at least the Han dynasty of China (206 BC–220 AD). The Chinese philosopher Confucius (551 – 479 BC) described the pug as a "short mouthed dog". The Pug, a Chinese Lion Dog or Foo Dog: The Pug was a "Foo Dog" or "Lion Dog" that was one of the sacred dogs of the Imperial Court of Peking (now Beijing). The Pug was one of the dogs of the Imperial Court of Peking, known as the Forbidden City, which was famous for its symbolic statues of Imperial guardian lions. The Forbidden City served as the imperial palace for 24 emperors during the Ming and Qing Dynasties (1368 - 1911). The Pug Foo Dog was revered as one of the sacred, holy dogs because it resembled the Chinese idea of a lion, which was a Buddhist symbol. Buddhism forbids the trade of living animals so the Pug was only given as a gift. The little dog was also deemed to be a symbolic guardian of the royal palace, and its inhabitants, who used them as lapdogs. 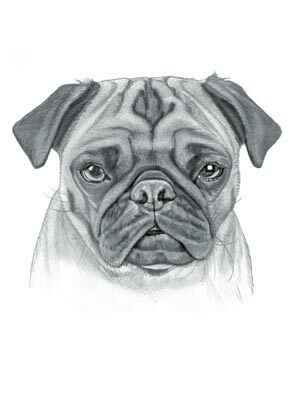 Pug History: Pug-like dogs were brought to Europe in the 1700's by the Dutch East India Company. The Pug became very popular with Dutch royalty and nobility. The Dutch name for the Pug was 'Mopshond' but the Pug was also referred to as the 'Dutch Bulldog'. In 1689 the Dutch Prince William and his wife Mary of Orange became the King and Queen of England and introduced the Pug to the royal court where it became a favored lapdog. In paintings that included the Pug, by famous artists such as Goya and William Hogarth, the dogs had longer legs and more prominent muzzles than the present Pug. The modern Pug's appearance changed following the Opium War (1839-1842) which forced China to open China to foreign trade. More Pugs found their way to the west, imported directly from China, and this new wave of Pug dogs were responsible for the changes in the look of the dog. One of the earliest written descriptions of the Pug was in the book "House Dogs and Sporting Dogs", published in 1861 by the Englishman John Meyrick, who described the breed in unflattering terms but conceded that "The rage for Pugs in this country [England] was once very great, and there is now some prospect of its revival; the price of Pugs being at present very high". The Pug was exported to the United States was officially recognized by the American Kennel Club (AKC) in 1885. During the late 1800's the Dowager Empress Cixi of China (29 November 1835 – 15 November 1908) kept breeding kennels for her Pugs, but following her death, and when China became a republic, the imperial kennels were closed down and the Pug became uncommon in their native China. Pug Modern History: The modern history of the Pug moved on and the breed is now used as a lovable, loyal family pet and cheerful, outgoing companion. Pug History - Pocahontas (1995 movie): The popular 1995 cartoon Disney movie 'Pocahontas' features a Pug called "Percy". In the movie "Percy" is Governor Ratcliffe's pet pug. Pug Height: The Pug breed is classified as a small sized dog. The height to the shoulder of a male dog is 12-14 inches (30-36 cm). The height to the shoulder of a female dog is 10-12 inches (25-30 cm). Pug Weight: The weight of this small sized dog, in a male dog is 13-20 pounds (6-9 kg). The weight of the smaller female dog is 13-18 pounds (6-8 kg). Pug Coat Type - LOW shedding coat: The coat type is described as a short, fine, soft, smooth coat. Pugs have a Melanistic Mask (a dark coloration of the skin or hair typically on the muzzle and face of the dog) because of a high concentration of melanin. Pug Coat Colors: The colors of this dog breed include black and fawn colors. Moles on the cheeks of the Pug are considered as beauty spots. Pug Grooming - LOW Grooming Needs: The grooming needs of the Pug are categorized as Low in order to maintain a healthy, tangle-free coat and reduce the risk of skin infections. The limited grooming needs of the Pug are considered to be low maintenance, requiring limited attention to grooming where brushing and combing, is concerned. Grooming Requirements should include bathing the dog on a monthly basis and making regular inspections of the nails, teeth, eyes and ears. Pug Litter Size: The litter size of this dog breed ranges from 2-4 puppies. Pug puppies for sale can be obtained reputable breeders and from rescue centers. The cost of Pug puppies varies depending on location, pedigree history and the dog breeder. Pug Temperament and personality: The temperament and personality of this popular dog breed is described as Faithful, Affectionate, Courageous, Loyal and Sweet-tempered. Pug Exercise Requirements - MINIMAL Exercise Requirements: The exercise requirements of this breed of dog is minimal. The Pug requires minimal daily exercise consisting of approximately 30 minutes every day. This small dog has a steady, purposeful gait with small strides and only requires a fairly slow speed by the owner to meet the dogs exercise requirements. Remember that it would take a lot of extra steps by your dog to keep up with your normal walking pace. Pug Diet: A fully grown Pug should be fed twice a day. A diet consisting of a premium dog food can be balanced with fresh food eaten by the family. The question is What Can Dogs Eat?. Check out our comprehensive list of what dogs can and what dogs cannot eat. Pug Health Problems: Potential health problems of the Pug breed include Eye conditions, Epilepsy, Patellar Luxation. Resolving health problems can prove to be expensive and it is always wise to obtain pet insurance or dog health insurance when buying a dog. Is the Pug dog breed said to be Hypoallergenic? Answer: No. Pug Lifespan: The life expectancy of dogs vary according to the size, breed of dog and any serious health problems. The typical lifespan of the Pug breed is 12-15 years. Pug Male Dog Names: Male Dog names are most often chosen to reflect favorite names of the owner or the strength, size, coloring and country of origin of the Pug breed. To give you some inspiration regarding good male Pug names our small selection might be of help with naming boy dogs. Our top male dog names are: Abel *** Karma *** Jax *** Cyrus *** Finn *** Ben *** Dred *** Flash *** Grendel *** Levi. Pug Female Dog Names: Female Dog names tend to be softer, prettier and reflect the temperament of the girl dog. Our top choice of good female Pug names are Jenna *** Cupid *** Bonnie *** Hiccup *** Minnie *** Heidi *** Brandy *** Rina *** Lily *** Sasha.